Send your or your students' favorite books of the year to Courtney to share on our social media in May. "The term “lame duck” is most often used to describe a president who is still sitting in office after his or her successor has been elected. Technically this person is still the president, but his or her decision-making power is generally perceived to be minimal. We have something like that in school: those days when technically we’re still in school, but because it’s right before vacation, the end of the school year is near, or we’re in the middle of standardized testing, those class hours don’t have the same instructional potential as your average school day. In some cases, like on standardized test days in certain districts, teachers are explicitly told they CAN’T plan regular instruction. On these Lame Duck days, it’s hard to figure out what we can do to still provide valuable learning experiences for our students. Sometimes instead of days, we have small bursts of Lame Duck time: The leftover 15 minutes after the fire drill, when you know you don’t have enough time to actually finish the lesson you were teaching, but you don’t want to just let them sit there. We often call the activities we need for these times “sponge activities.” Regardless of what you call it or how much you need, we all have those times when students are right in front of us but the regularly scheduled programming just isn’t going to work. The paragraphs on why not to show videos in class provide the author's perspective. 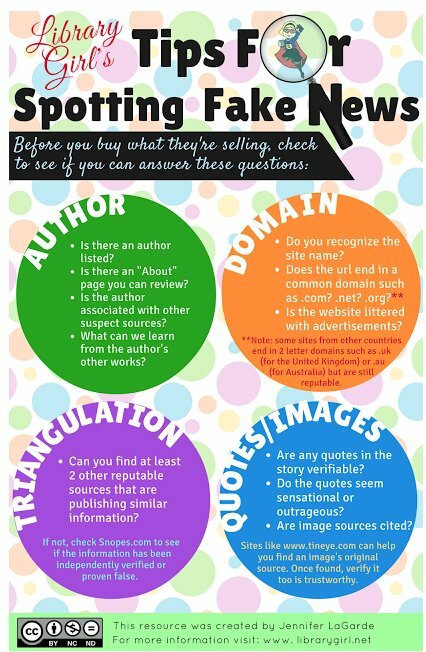 For you, it comes down to the Media Use Guidelines in the A+ Curriculum Guides and copyright. There are some activities in here that do not provide much of an instructional component (like coloring books), so be sure to read through the offerings carefully. 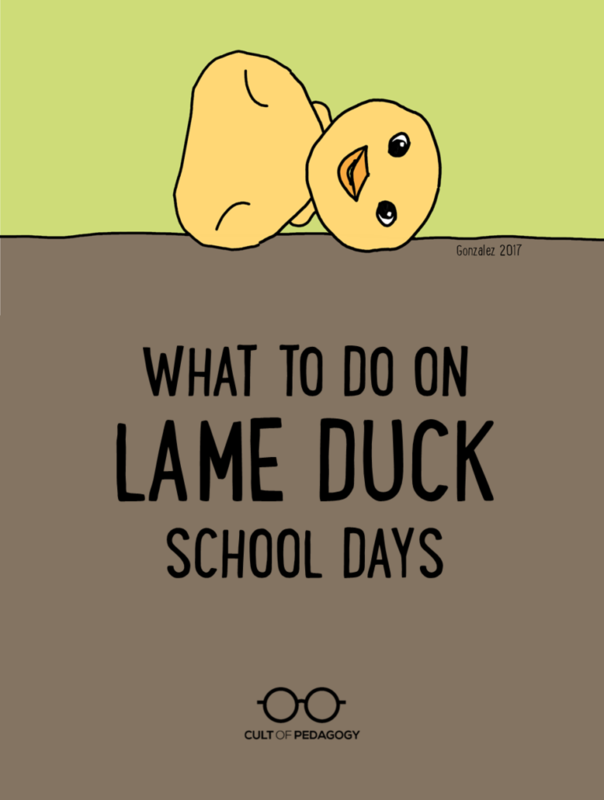 What do you do on lame duck days or for sponge time? 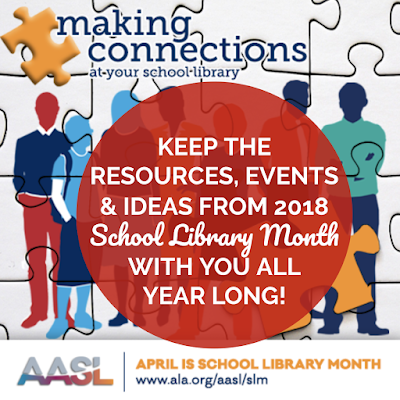 As we wrap up a wonderful School Library Month, we all look back at the amazing resources, events and ideas that were shared and celebrated in April. I learned so much all four weeks by following along and participating in lots of ways including conferences like TLA; the AASL School Library Month site; Knowledge Quest blog; during special AASL webinars; on Twitter and Instagram following #AASLslm and #SLM18; and from school librarians, educators and others each and every day. I gathered up these resources, events and ideas each week and shared them in four special Collections by Destiny. These are public and will be available forever. I will continue to add resources that fit into each as I come across them and please share things with me that fit too. I hope everyone had a very special School Library Month. I am inspired by all of the things that are happening in our libraries and schools. 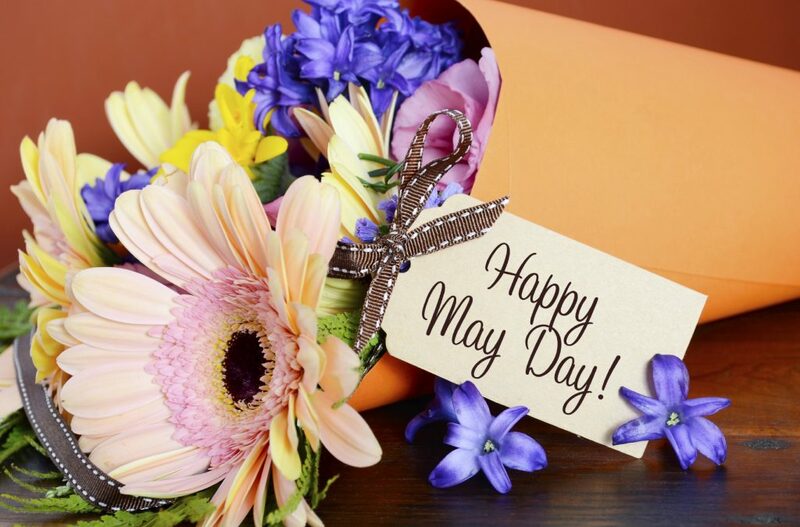 You are making a difference for communities, teachers, families and most of all, the children that you work with everyday. Together during this month, and all throughout the year, we can make a difference together and show the importance of school libraries and librarians. Let's keep this celebration going all year long, friends. Keep School Library Month 2018 With You All Year Long! Reading along with a podcast builds confidence and literacy. Podcasts present a broad array of narrative types and subject matter. Reading along keeps easily distracted students extremely focused. Podcasts are free, accessible, and always contemporary. 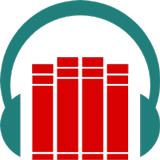 Is Listening to An Audio Book "Cheating"? An influential model of reading is the simple view (Gough & Tumner, 1986), which claims that two fundamental processes contribute to reading: decoding and language processing. “Decoding” obviously refers to figuring out words from print. “Language processing” refers to the same mental processes you use for oral language. Reading, as an evolutionary late-comer, must piggy-back on mental processes that already existed, and spoken communication does much of the lending. So according to the simple model, listening to an audio book is exactly like reading print, except that the latter requires decoding and the former doesn’t. Is the simple view right? Full Article--Is Listening to an Audio book "Cheating"?